Traditionally Osso Buco is a veal shank recipe, but this updated venison osso buco recipe is a great way to use deer meat. 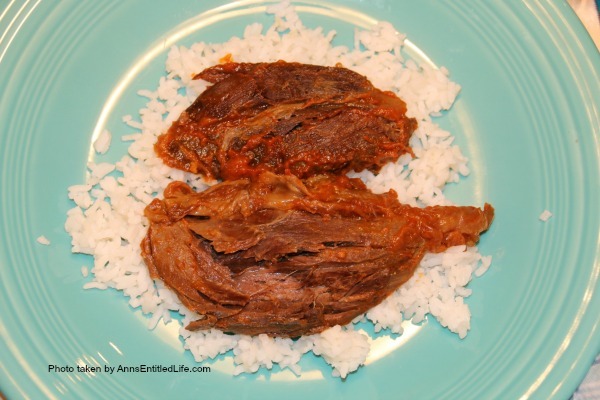 This recipe takes a tough piece of meat (with a lot of connective tissue), and makes it into a tender, delicious meal! Serve over risotto, rice, or mashed potatoes and with braised vegetables. 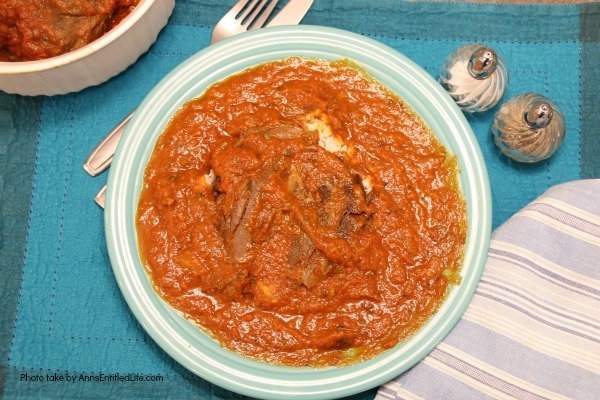 Like many tomato dishes, this osso buco tastes great the next day too! You can also freeze for later use. This is a wonderful make-ahead venison dish. As many of you know from reading my newsletter, my husband is a hunter. We (that is the royal “we” because I almost never go there) own hunting land up by Lake Ontario. He has deer and all sorts of fowl (turkey, pheasant, etc.) running wild (literally) on that land. Every year he and some friends get together and hunt poor little Bambi as they like the meat. This year Hubby ended up getting several deer. For those who do not live in a suburb or rural northeast, deer are what I call “suburban rats”. They are everywhere and cause a lot of destruction to vegetation (NYS releases out-of-season nuisance permits to deplete the population after the regular season is over, that is how many deer are in NYS). They are also the cause of many a car accident. I always worried about Sonny-boy’s low-slung sports car meeting one during the rut (when the males chase the females and are running wild) and having one go through his windshield. I’ve shared a few of Hubby’s venison recipes in the past including Venison Jerky (which we currently have a TON of!) and Venison Stew. 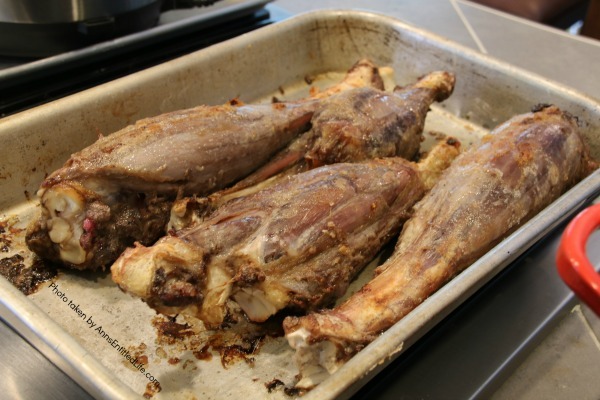 • You may need to trim (err, saw) the shank bones so that they fit in the pot. If so, make sure to rinse off any bone dust and pat dry. I prefer to keep the bones whole if possible. 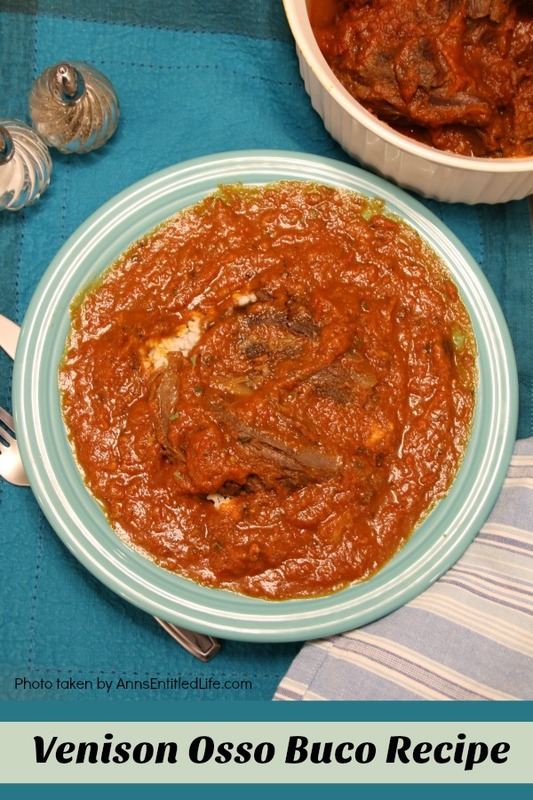 • You will be amazed at how far tomato sauce can splash when you are moving around the shanks in the Dutch oven. Turn them over carefully, and try not to drop them in the sauce. • This freezes very well. • The sauce thickens a LOT. 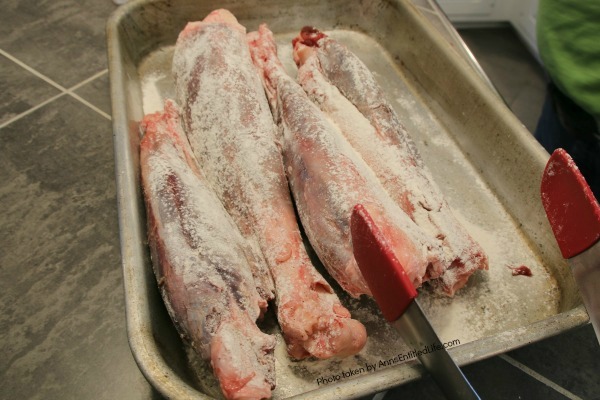 You may want to consider keeping the sauce separate from the venison when serving and freezing. • Preheat broiler to 375°F. • Season shanks with salt and pepper, turn and salt and pepper all sides. • Shake flour over shanks (all sides), patting the flour into the skin. • Slather melted bacon grease (about 3-4 tablespoons) all over the shanks with the silicone basting brush. 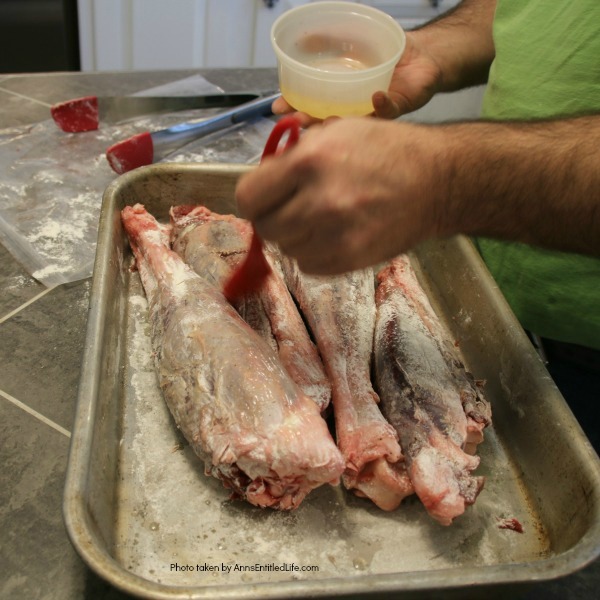 • Place venison shanks in a large baking pan and broil about 5 minutes per side, 20 minutes total, until the shanks are nicely browned. • Turn on the oven to 325°F. 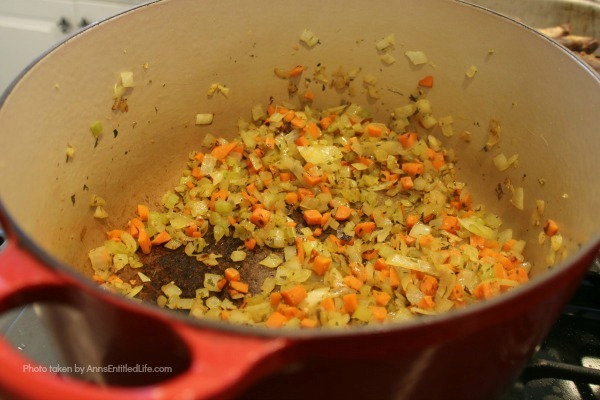 • Under medium-high heat, sauté chop onion, carrot, celery, and garlic, stirring frequently until vegetables are softened and just starting to turn a light golden color, about 6 minutes. About halfway through cooking, sprinkle with the oregano and thyme. 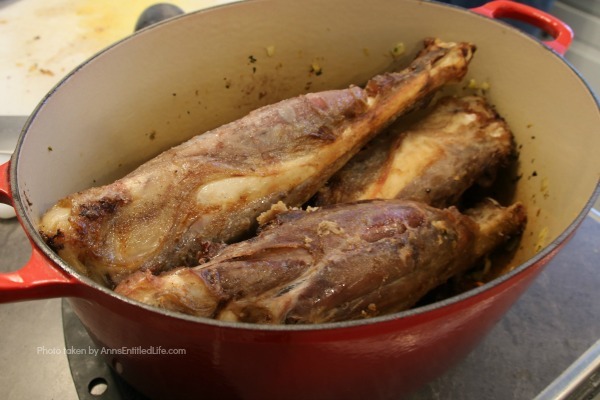 • Place the browned shanks in the Dutch oven. Try to arrange the shanks in as even a layer as possible (a little overlap is okay to make them fit). 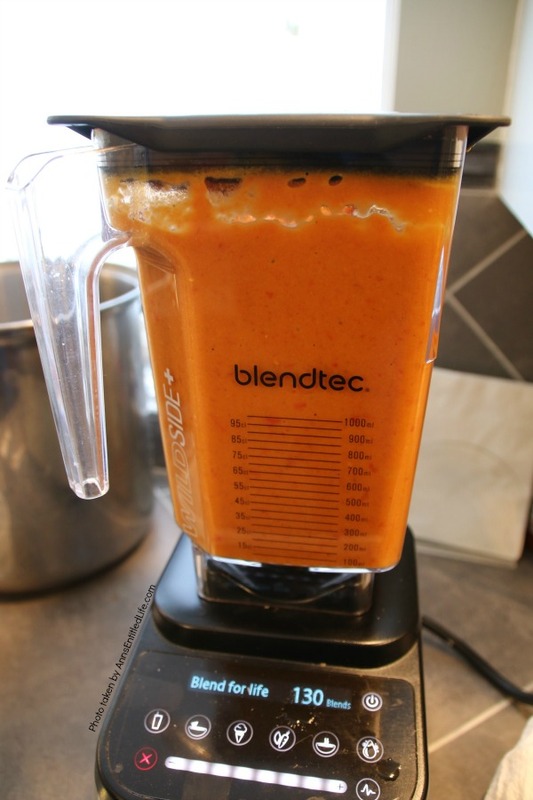 • Then, carefully cover the shanks with the sauce from the blender and the crushed tomatoes. Use a small ladle to completely cover the shanks with sauce. The sauce should cover the shanks at least half way up; if it doesn’t, add more stock until it does. • Add bay leaf to pot. • Cover and cook in the oven for 30 minutes. 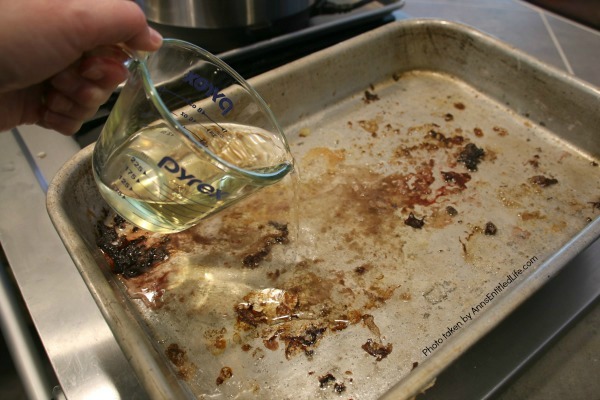 • After 30 minutes in the oven, turn down the oven temperature to 250°F and cook for approximately 3-4 hours. • Every 45 minutes, turn, flip, and rearrange the shanks in the sauce, and ladle the sauce over the shanks so they stay moist. At first, the sauce might look a little chunky, but it will smooth out by the time the dish is done. After about 2-3 hours, you will see the meat start to separate from the bone. 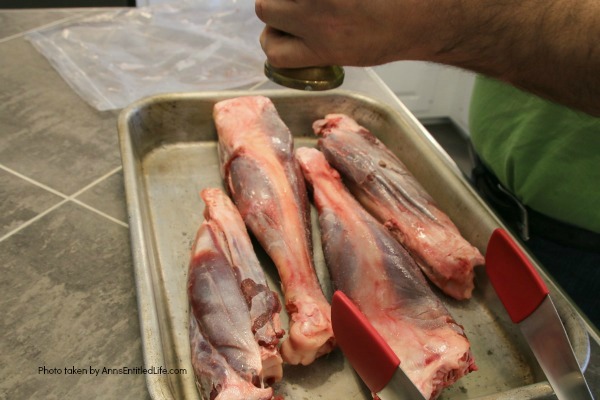 At this point, cut off the clumps of meat where they are attached to the bones at either end and remove the bones. (Again, be careful not to make a mess. I have had to clean sauce off of the ceiling and walls after flipping.) 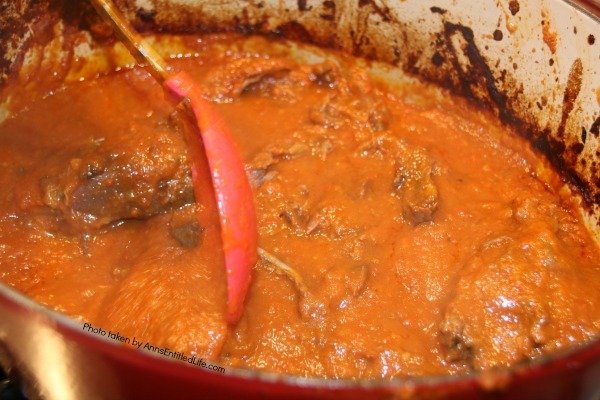 Try to submerge the meat in the sauce as much as possible. As long as the meat is mostly covered in sauce, do not worry about overcooking it. If the sauce becomes too thick/low, add more stock as needed. • When the meat is fork tender, you can call it done. • When the meat is getting close to done, in a small bowl stir together the parsley, lemon zest, and garlic to make the gremolata. Set aside. • When the meat is done, carefully remove it from the sauce with tongs and a large spoon and place on a large platter or serving vessel and loosely cover with foil. 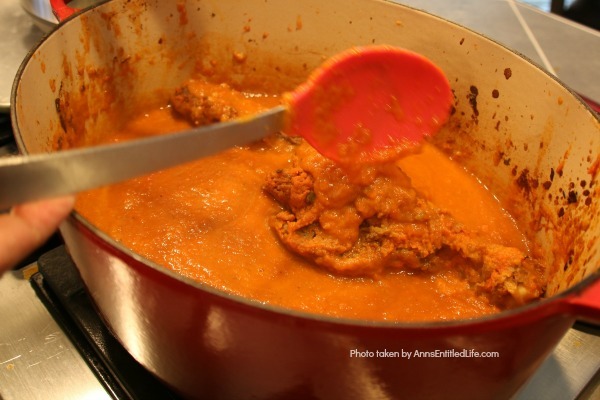 The sauce in the Dutch oven should be smooth and thick (if not, give it a good stir with a large spoon); you can adjust the consistency by adding stock to thin the sauce, or, if necessary cooking it in the oven uncovered until more fully reduced. Once the sauce looks good, discard the bay leaf if you can find it. • To serve, once the shank meat has cooled off a bit, break up the lumps of meat by pressing on them with the flat of a large kitchen knife, breaking them off into large chunks. You may also cut the lumps of meat into large slices on a cutting board. Place meat pieces/slices on a dinner plate over risotto, cooked rice, or mashed potatoes, and then generously spoon the sauce over the meat. Garnish with sprinkled parsley. 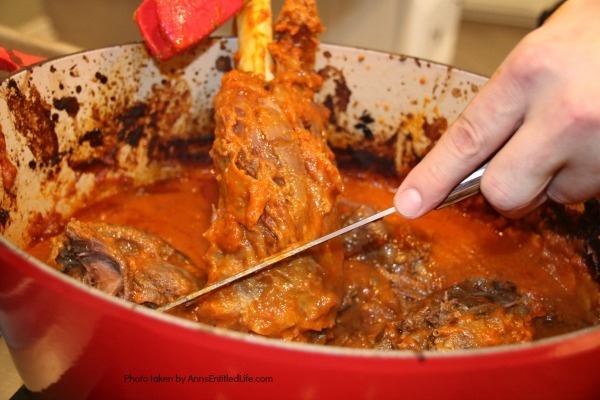 This venison osso buco recipe uses venison shanks to make a tender, delicious meal! Serve over risotto, rice, or mashed potatoes and with braised vegetables for a perfect meal. 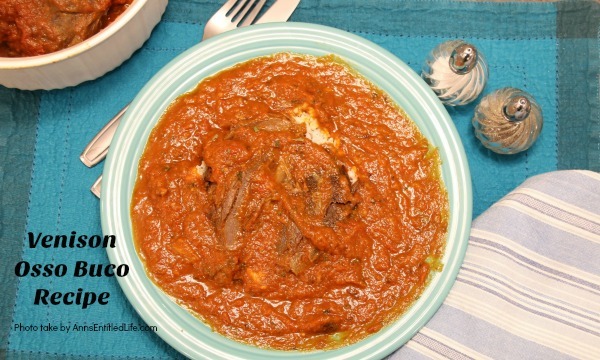 As with so many tomato dishes, this osso buco tastes great the next day too! You can also freeze for later use. 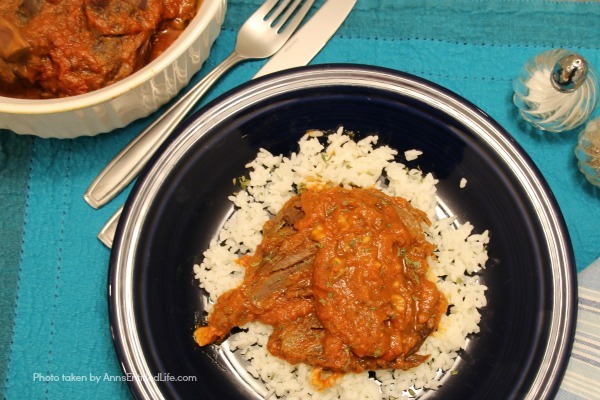 This is a wonderful make-ahead venison dish. • Every 45 minutes, turn, flip, and rearrange the shanks in the sauce, and ladle the sauce over the shanks so they stay moist. 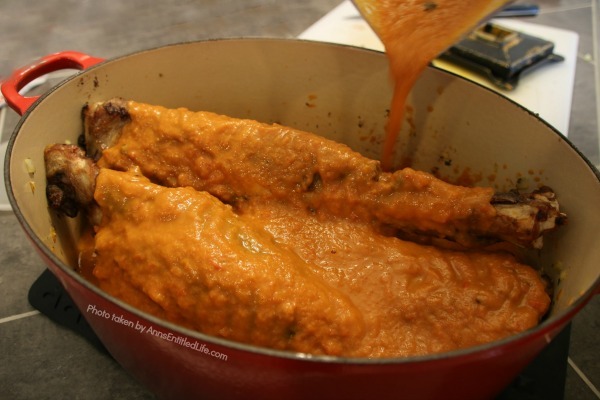 At first, the sauce might look a little chunky, but it will smooth out by the time the dish is done. After about 2-3 hours, you will see the meat start to separate from the bone. At this point, cut off the clumps of meat where they are attached to the bones at either end and remove the bones. .(Again, be careful not to make a mess. I have had to clean sauce off of the ceiling and walls after flipping.) Try to submerge the meat in the sauce as much as possible. As long as the meat is mostly covered in sauce, do not worry about overcooking it. 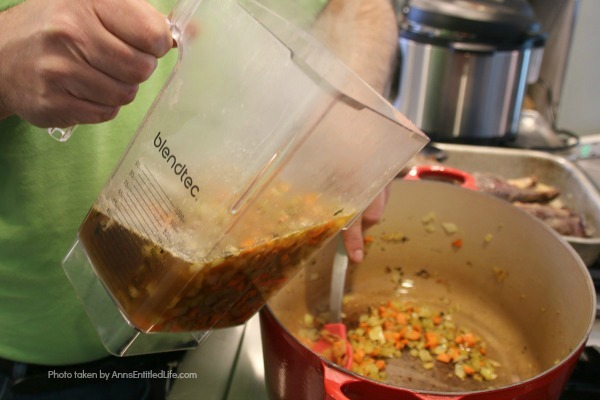 If the sauce becomes too thick/low, add more stock as needed. 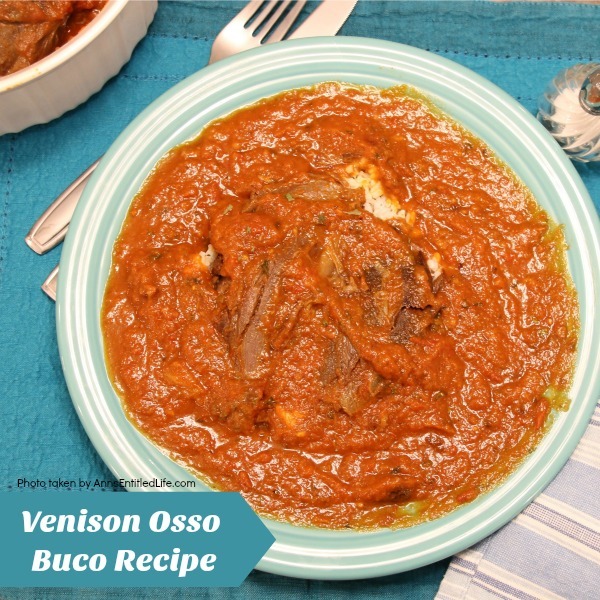 • To print the Venison Osso Buco recipe click here.